Ciao amici! I have been living in Rome for the past three weeks and it has been quite a ride! Every single day there are new towns to be explored, amazing new foods to try, and incredible people to meet. So far these past three weeks have been completely unforgettable, and here is an update on how things are going while studying abroad in Rome, Italy. At first, it was hard for me to adjust to my new life living in Rome. When I arrived, I found out that I would be in a single room because my roommate had dropped out of Loyola’s Rome program. This caught me off guard because I have shared a room with someone my whole life; my younger sister at home and a roommate in college. The first night was different but now I love having a nice quiet place to myself after a long day of socializing. The second day here, I met some of the most genuine people and I became friends with them very quickly. Our school organized a scavenger hunt all throughout downtown Rome for everyone to participate in. I went with my new friends, Anna, Maddie, Maria, Ashley, Jen, Cecily, and Riley but as soon as we stepped off the bus we were lost. This was a blessing in disguise, because as we were walking around the city we stumbled upon the Trevi Fountain and the Pantheon which was an amazing surprise. The next day, our school spent a day at the Colosseum and The Roman Forum. Both of these historical sites completely took my breath away, and I couldn’t believe that the sites that I have always seen in magazines and in movies were right in front of me. On Sunday, our school took a class trip to Maccarese beach and I could not wait to take my first swim in the sea. However, my excitement quickly faded as my two friends, Maria and Jen, both got stung by Italian jellyfish as we were all swimming. Despite this, everything was completely fine after they realized the lifeguard who would be helping them looked like an Italian Zac Efron. As the day came to an end, our extremely sunburnt class made our way back to campus, as we all needed plenty of rest for our first day of classes the following day. The first week of classes were very laid back since it was syllabus week and everyone was still getting to know each other. It is so nice having class at the John Felice Rome Center, because everything is in the same building which means I can literally roll out of bed five minutes before my class starts and still be on time. The week went by very quickly, since we don’t have class on Fridays here which is the most amazing thing ever. On Friday, our school had a class trip to Umbria, Italy. 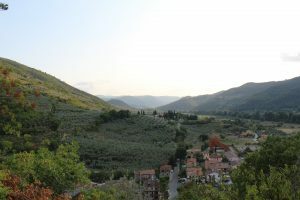 When we arrived, I was astonished by how gorgeous the Italian countryside is in person. There were cobblestone streets everywhere, huge hills and mountains all around us, and cute little churches on every street. Our school took a boat ride to a small island where we got to try traditional mediterranean seafood. The food was interesting to say the least, but I am happy that I stepped outside of my comfort zone and tried some new food that I would never usually eat. 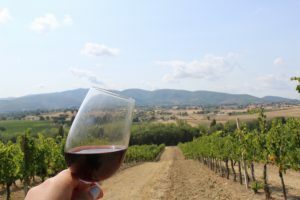 The next day was by far my favorite day, as our class took a trip to Le Climate do Montefalco which was a beautiful winery in the countryside. We got to take a tour of the whole vineyard and taste some of the different types of wine that were made at the vineyard. After the vineyard, we went to a small village in the mountains where we toured an old church and a mummy cemetery. Everyone in my group was completely freaked out by the mummies, but I thought it was fascinating because it reminded me of The Catacombs in Paris that I went to in high school. After the museum, we had the option to attend mass of to explore the town. I originally wanted to attend the mass but my plans changed as I saw that the last bus left without me. Although I was bummed, it was a blessing in disguise because me and my friend Anna decided to hike in the hills and we found an old castle. The castle wa so beautiful even though it was damaged and falling apart. It had the best view of the whole entire town and it was a moment that I will never forget. After that, our class went back to the hotel where we had an amazing dinner of traditional pasta bolognese. The last day in Umbria, a huge storm came which resulted in some of the plans being canceled. Although this was a bummer, I was happy that it was raining because Italy has been in a severe drought for almost four months. The day seemed like it lasted forever, but I couldn’t wait to get back to the campus which is a place I now consider my home. After a long exhausting weekend of traveling in Umbria, I was excited to be back at school and I couldn’t wait to start exploring more of Rome. On Wednesday, our school had the Mass of the Holy Spirit to wrap up the end of orientation. The mass took place at one of the most beautiful churches that I have ever seen in my life called Chiesa di Sant’ Ignazio di Loyola. The interior of this church was some of the most intricate architecture and as the mass was going on, I couldn’t help but gaze all around the church and admire its beauty. After mass, we went out to dinner and I got to try the infamous pear pasta that everyone always talks about. It was one of the best things that I have ever tried and I can’t wait to go back and get more! 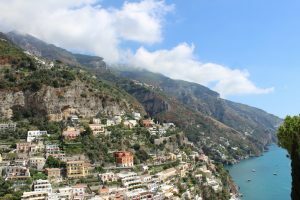 The week came to a close and my friends and I took our first planned trip of the semester to the Amalfi Coast. We had to wake up on Friday at 5:30 in the morning in order to catch our train which left at 7. Although we barely slept and were extremely tired, it was all worth it when we got to the Amalfi Coast and saw how beautiful it was. My friends and I rented an Airbnb that was located on a lemon farm and was incredibly gorgeous. 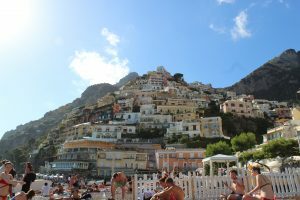 Our first day, we took a bus to a town called Positano which was personally my favorite part of the whole trip. When we arrived, we went out to eat and a restaurant that had the best view of the whole town, and I ate some amazing cream pasta. After lunch, we explored the town and went shopping where we bought limoncello, gifts for our friends and family, and a ton of new clothes that all put a huge dent in my bank account. As the day started to come to a close, we went to Positano’s main beach where we swam in the sea, watched the sunset, and saw a small local concert. Although it was the most amazing day, our bus ride home definitely put a damper on my friends and I. Everyone got extremely car sick because our bus driver was driving very fast and the roads on the Amalfi Coast are all hairpin turns which we are definitely not used to back in Chicago. Although that wasn’t the best experience, the end to our day was perfect because we got takeout gelato and pizza. The next day we had to wake up early again in order to take a ferry ride to the island of Capri. When we got to the island, I was amazed at how perfect the town looked with the gigantic cliffs and the crystal clear blue water. We had lunch and then took a private boat tour for two hours that I really enjoyed, but my friends did not since the waves were huge that day and it reminded us of being car sick the previous day. After the boat ride, we went to Anacapri where we took a chair lift to the highest point on the whole entire island. This was my favorite part of the day, because the view was incredible, as you could look out and see the other islands in the distance as well as look down at the whole entire town of Capri. After this, we went back to our airbnb and got the same takeout pizza from the night before because it was too good to pass up. On our last day, we explored the town of Sorrento and went on a shopping spree again. It was so much fun to bargain with all of the street vendors and get some of the best deals ever (I got an Italian leather purse for just 25 euros)! After a day of shopping, we departed on our long journey back to Rome. Although the Amalfi Coast was amazing, I couldn’t wait to get back to campus and be at the place that I now call home. These past three weeks have been full of amazing adventures that I will never forget, and I cannot wait what the future of me living in Rome has in store. Arrivederci!